We came back down to earth a bit yesterday, going 1-4 overall on the night. At least the winner was on our Best Bet, the Penguins Team Total Over 2.5, as Pittsburgh downed the Canadiens 4-1 in Montreal. It’s been really odd to see elite goalies like Carey Price and Henrik Lundqvist look so mediocre lately. Speaking of Lundqvist, he’s expected to be back in the cage tonight against a red-hot Leafs team. After getting torched by Dallas two nights ago at Madison Square Garden, it’ll be interesting to see if that was his rock bottom and he can start to turn around his season tonight. There’s 8 games tonight in the NHL! Below is our favourite bet of the day, along with stats, trends and tips for the other 7 contests. We were really surprised to see the line move towards Dallas yesterday after the Islanders opened as -125 favourites. But we’re just going to trust the numbers on this one and take a shot on the Islanders to win their first game since firing head coach Jack Capuano. The Capuano firing was also a surprise – not necessarily that it happened, but when it happened. New York was coming off a nice 4-0 win in Boston on Monday afternoon, and they’re really not playing that badly of late. They’ve scored 4 goals or more in 3 straight games and 7 of their last 10, and the 3 games they didn’t pot 4 goals or more were immediately after their bye week that really seemed to interrupt the momentum they had. New York’s also taking care of business at its own end of the rink, allowing 2 goals or less in 6 of its last 7 games. Dallas got a nice win Tuesday over the Rangers, but it should have been a lot more comfortable. The Stars took advantage of a struggling Lundqvist to score 7 goals on 20 shots, yet needed to sweat out a 7-6 victory after allowing the Rangers to score 3 times in the third period. Dallas can put the puck in the net, but those defensive issues (4+ goals against in 6 of their last 8 games) are a big reason why they’re 6-15 in their last 21 road games. They also struggle on short rest, going 4-14 in their last 18 when playing their 3rd game in 4 days, as they are tonight. Note: We also like the Islanders on the First Period Moneyline (-111) and the First Period Over 1.5 (-111). Dallas has been outscored 16-10 in the first period over its last 10 games. Reasons to bet Ottawa: The Senators have won 3 of their last 4 games, scoring 4 goals or more in each of those victories. Columbus is 3-4 since its 16-game winning streak. Reasons to bet Columbus: The Blue Jackets are 17-4-1 at home. Ottawa has given up 3 goals or more in 3 of its last 4 and 5 of 8. Reasons to bet New York: The Rangers have won 9 of their last 11 road games. Toronto has been outshot in 5 of its last 7 games. 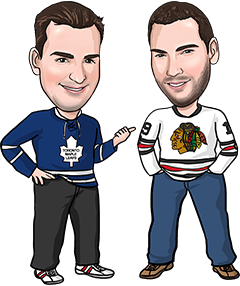 Reasons to bet Toronto: The Leafs are 9-2 in their last 11 games and have scored 4 goals or more in 6 of their last 7 outings. New York allowed 7 goals Tuesday at home to Dallas and has given up 20 goals in its last 4 games. Reasons to bet Washington: The Capitals have outscored their opponents 47-19 over their last 10 games, winning 9 of them. St. Louis has dropped 4 of its last 6 at home. Reasons to bet St. Louis: The Blues are 16-6-4 at home on the season. Washington could let down emotionally after Monday’s tough 8-7 OT loss to Pittsburgh, which snapped the Capitals’ 9-game winning streak. Reasons to bet Arizona: The Coyotes pay as high as 3 to 1 on the moneyline at some sportsbooks. Minnesota lost at home to New Jersey on Tuesday. Reasons to bet Minnesota: The Wild is 9-2 in its last 11 home games and 19-7 in its last 26 games overall. Arizona is playing for the second straight night, 3rd time in 4 days, 4th in 6 and 6th in 9. Reasons to bet Nashville: The Predators have been playing phenomenal defence lately, holding 6 of their last 9 opponents to 1 regulation time goal or less. Reasons to bet Calgary: The Flames have won 5 of their last 6 home games and are playing strong defence themselves, allowing 2 goals or less in 8 of their last 9. Nashville has scored 2 goals or less in 5 of its last 6. Reasons to bet Colorado: The Avalanche has earned 16 of its 27 points this season on the road, where it’s 8-12 on the year. Anaheim has scored 2 regulation time goals or less in 6 of its last 8 games and is playing its 4th game in 6 days. Reasons to bet Anaheim: The Ducks have lost once in regulation time in their last 10 games (7-1-2). Colorado has lost 8 of its last 9 games. Reasons to bet Tampa: The Lightning has allowed just 7 regulation time goals in its last 4 games, going 2-1-1 in those contests. San Jose has surrendered 2 goals or more in 9 straight games, and 3+ in 6 of those 9. Reasons to bet San Jose: The Sharks have won 2 straight games after a 2-4-1 slump and are 15-6-1 at home. Tampa’s lost 6 of its last 7 road games.